A few weeks ago, we went over to our friends Ben and Elisa’s house. As it happened, their neighborhood was having a big yard sale earlier in the day that we couldn’t attend, but some people still were selling when we got to their house in the late afternoon. Now, a house near them had recently been sold, as the 90+ year old woman who lived there was moving into a nursing home. And Ben and Elisa knew the house hadn’t really been updated in decades, so they suspected there was a chance there might be something Mel and I would like. So even though it was late in the day, we all walked across the alley to check it out. About 20 minutes later, this was mine. 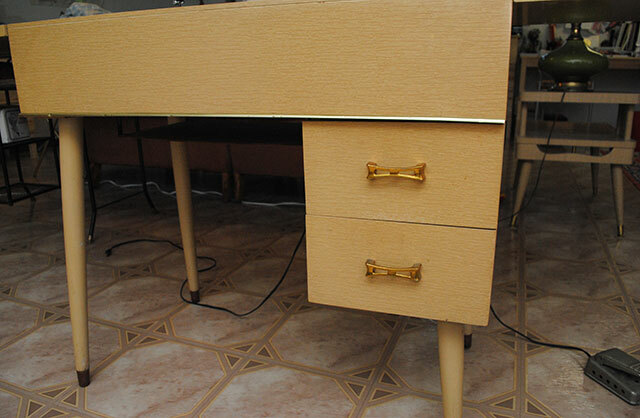 A cute vintage desk, right? Well as the title of this post would lead you to believe, there’s more to this desk than initially meets the eye. Yes, it’s a vintage sewing machine cabinet and sewing machine! I was absolutely not in the market for a vintage sewing machine, but when I saw this for $40, I was sorely tempted. The opportunity to buy a heavy duty vintage sewing machine, complete in a cabinet that was a style I loved, from the original owner (well technically her daughter-in-law and granddaughter)… too good of an opportunity to pass up. And then when she said I could have it for $20?? Oh yeah, it came home with me. The machine is a Kenmore Stylist 86, and from researching the model and serial number, it was made between 1959-1963. It came with an accessory box marked 1960, so I’m guessing that this machine might have been from 1960 (or at least not earlier). My mom also backed this theory up as she thinks it’s possible this was the same machine she learned to sew on when she was very little! She knew it was a Kenmore and recalled the sort of underwhelming pinky tan colors, and that it was from 1960. 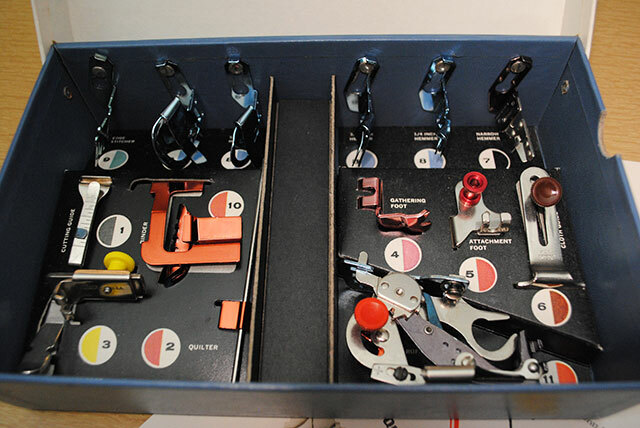 Speaking of accessories, the drawers were full of lots of fun things, including the original manual, yippee! Inside, all of the feet and accessories (like a cloth guide) are color-coded. And for each item, there’s a color-coordinated card explaining how to use it! Which is good, because some of these things are completely unfamiliar to me. 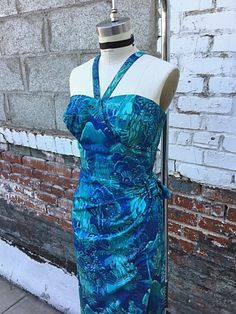 Fortunately, my sewing area is in our semi-finished basement, so I had room to grow with an entire new sewing machine table, otherwise I would have had to say no to this great find. I still need to put together my sewing space in a way that works better than piling every available surface with stuff using a hodge podge of furniture. We really need to investigate storage, bookcases, etc. for the whole basement. But right now we’re focusing on finishing up some things upstairs first. (I kept my promise and we bought paint samples yesterday and are painting our bedroom and the den this weekend!) So in the meantime, this is just sitting in the middle of the room. But we’ll get there! Now the ultimate question: does it run? Kind of. There was something tripping up the lowering of the needle after a few test stitches. Fortunately, there’s a sewing machine repair place near us, who didn’t even bat an eye at the thought of repairing a sewing machine from 1960 (he said they had parts dating back to the 1800s). I was going to have to take it in to get a tune-up anyway, so now they’ll be able to get it in proper working order. Although getting the machine there will be a feat in itself—holy crap, now I know why people love vintage machines. This thing is a tank! And while the machine itself isn’t particularly exciting to look at (not like a pretty mint green or blue like some of its vintage peers), I do love the very modern Kenmore logo on it, and the completely swoon-worthy cabinet it’s in! The mid-century modern style of the cabinet is so perfect to me. In fact, just behind it you can see a tiered end table we have that’s a great match (the end table has matching ones upstairs in our den). 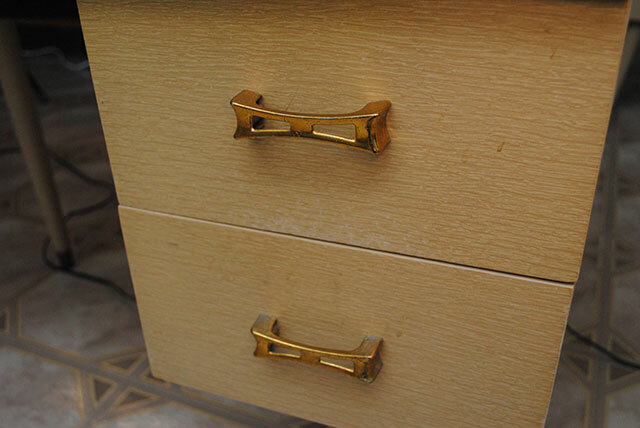 And oh how I adore those bow-shaped drawer pulls! They were the first thing that sucked me in. Or maybe it was the sewing machine itself. Or the cabinet. Whatever, it’s a fantastic package all the way around! Those in the U.S. will recognize Kenmore as a Sears brand name, and in my neighborhood there’s a huge flagship Sears that opened in 1938 (it celebrated 75 years at its location last year). It’s undoubtedly where this sewing machine was purchased by the original owner in the early 60s, as her house was just a few minutes away from the store. And now the sewing machine is just a few minutes further away, at our house. I think that’s pretty neat! While I haven’t been able to use it yet, I already love this machine and how I acquired it. The story makes it way more special than just being a great deal. I can’t wait to get this sewing machine fixed up, and take her for a test drive! So, what do I name her?? What a great find! I just purchased my first vintage machine today, it’s amazing how heavy these machines are! Oooo. 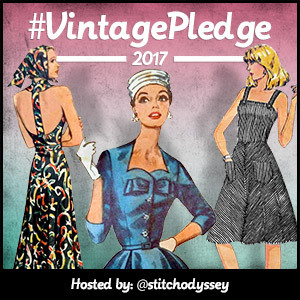 I love sewing on my vintage machines – but they all have their own quirks to get used to. No doubt you’ll love it when it’s all fixed up and ready to go. What an excellent foot haul too! Wow, excellent find & story! That is an Eleanor in my book. Absolutely lovely, and she just looks…dependable? I love the style of that cabinet, too; I’ve never been lucky enough to see one like that irl. All the ones I’ve seen have been blockier. More…Beth? Bertha? Something like that. Sorry this is no accident, this is FATE. 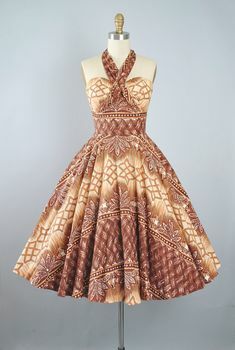 What an amazingly gorgeous find, I’m so jealous! The fold out table and all. I read on the internet those Kenmore machines are great. Those bows make me think of a little bit French style names. Something fun like Fifi? Elegant like Delphine? Or is she more sturdy and reliable, like say an Elsa?! Wow want an exciting find. Definitely worth the effort of getting it to the sewing machine repair place. I have just inherited a 1980s Bernina which having never really sewed before being more of a knitter am very excited to start getting to grips with. I accidentally picked up a sewing machine once. When I lived in Philadelphia, there were always lamps, couches, and small tables being left on the curb for people to take. One day we passed by a side table with a sign saying “still works” We laughed, duh it still works, the table still had four legs. So we lugged it home, thinking it was really heavy. When we got it in light we figured out it had a sewing machine built into it. I don’t think anyone kept it once we moved out of the apartment though. I kind-of wish I had the space at the time since it was a cool random find… even if I already have a machine. Uhh that’s glorious. I am especially awed by the foot collection. Please do another post and show the descriptions. There are now apps which describe what foot does what, but this is so much more charming! My vintage Bernina Record is the BEST machine I’ve had, and I’ve cursed at quite a few modern machines prior, that even with her quirks I’d hesitate buying anything new again. “They don’t make ’em like they use to” is so true with older machines. Built like tanks with the weight to prove it. I would have been all over that table at $40 just for its MCM style even without the sewing machine but you super scored. Also we might be close-ish neighbors (North Park here). Hiya neighbor! I’m new to the area and have yet to find a place to service my machine. Willing to disclose your repair shop? My Bernie (short for Bernadette, of course) needs love. 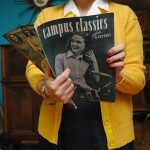 As for names, since she’s a vintage girl with bows on her outfit, how about Susie (the #2 girls name in 1960)? Hi there! Of course I’m happy to share! It’s the Singer Factory Distributor on Irving Park just west of Cicero. They didn’t even think a machine from 1960 was that old when I called to ask. They’re very nice there, I’ve taken my 12-year-old Singer there to get it tuned up so it was the first place I thought to check. I’m sure they’d give Bernie a check-up! Thanks for the lead. I’m so happy to hear of someone close by that would take the old girl. Just wanted to second that – the Singer Factory is great. I’ve had machines repaired there and also purchased from them. Very nice, knowledgable people. And, what a great find Tasha! How cool! I live for great yard sale finds like that! I actually have a similar machine which I think is from the 50s that I bought at a yard sale and need to get tuned up (when I have the extra money, ha ha). I bought it because it seemed really heavy-duty as well. Seeing your post makes me want to finally dig it out of the closet! It’s stunning! I love the way old sewing machine cabinets are so practical: you can store it away when it’s not needed but when it is, it becomes amazing. WOW WOW WOW. Amazing find. What a find! Excellent work. Kellie the Kenmore? (I can never resist a bit of alliteration). Or perhaps Casey, or Caspian? 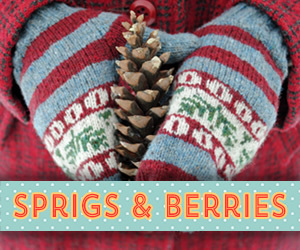 (although they’re a bit boyish). Or Kathleen? Kerry? OK I’ll get back in my box now. You should name her Pearl, because she’s pearly colors and she was something unexpected inside your desk. What a fabulous find! I can’t help but tell you, I had to do a double take as your friends have the same names as my husband and I! I bet they are great people! Hee, hee… Enjoy your new treasure! what a great find!! and so much fun to be have testing out all the different feet! Oh what a fabulous find. I bet once this machine has been fixed it will run beautifully. I would name her after the original owner as a way of keeping her memory alive. Have fun finding out all the things this lovely machine is capable of sewing. Wow, that’s a great find, especially for such a low price. 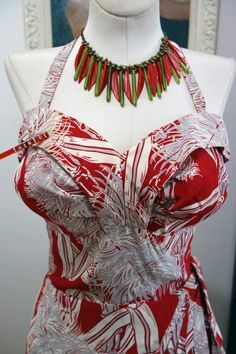 I love the ‘sew by color’ accessories. What a wonderful find! Congratulations! I have a fondness for Kenmore cabinet machines like this, because I learned to sew on my mom’s 1963 model. Those color-coded accessories are amazing – you will have so much fun playing with those! Do you know the name of the original owner? I think it would be neat to name it after her. I think you should name her after the gal who took such good care of her for 70 years! My village is doing a garage sale this Saturday (70 sales all at once!). I hope I do as well as you did! The condition of it all is amazing too,very nice! Beautiful machine and a great find! I just love the cabinet, too! She either took good care of it or didn’t use it much. It’s amazing how the Kenmores changed in a span of a few years. I have one from the latter part of the 60s and its all plastic in an ugly particle board cabinet. 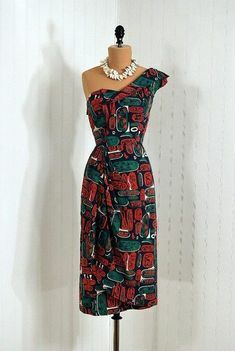 Thankfully I also inherited my grandma’s early 60s pfaff and that is a metal beauty almost as pretty as your new beauty. It’s wonderful that of all things, it’s easier to find a sewing machine repair shop and parts, than for repairing a classic car! Those bow shaped drawer pulls are the first thing I noticed. So cute. A great find! I love your little Kenmore beauty, and what a fabulous price! I usually limit myself to $50 for mbint condition machines. I have many vintage machines and have a best friend that turned me onto the joys of old singers. I think a good name for her would be Betsy. Enjoy. WOW! The accessory box with all those feet! HOLY COW. This is a great find. It was clearly meant to be yours. I mean, she sat all day there waiting for you to come find her! It fantastic that your local repair shop is going to get her in working order for you. I’m sure you have many adventures ahead of you! Wooow!!! Lucky girl!! it is beautiful and it has the original accesories and manual! Oh my god, it’s fabulous!! 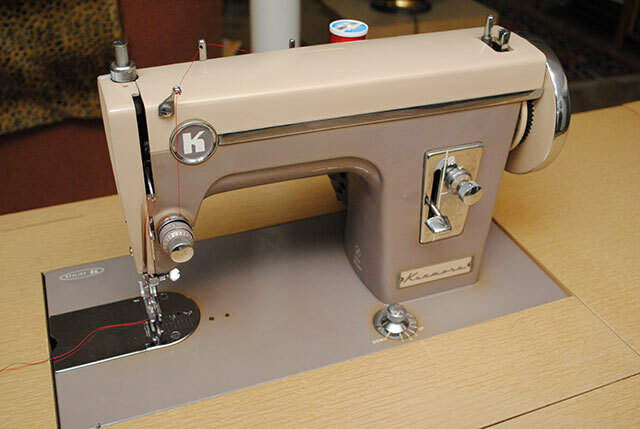 My first sewing machine (that wasn’t a hand-me-down) was a Kenmore and it’s still running great. I love the cabinet too! I have an older sewing machine cabinet (probably late 30s or early 40s) that my dad refinished for me. That one was trashed when I bought it – machine wrecked beyond repair – but this one looks pristine! What a great find! Such a nice looking cabinet and machine. I love the box of feet and notions. Wowsers! What a great find! It definitely had to come home with you. Also, it’s great that this machine has gone to someone that will actually use it. I suppose a lot of people would have just wanted the table, and not used the machine; or (horrors!!) thrown the machine away! I also love that the accessories box is still there! I hope you can get it working again. If I came across a sewing machine that nice for $20 it would “accidentally” come home with me too. 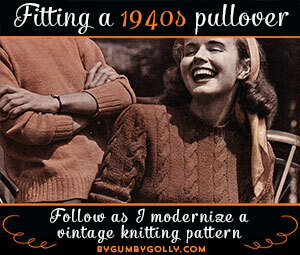 It’s a great find, and I can’t wait to see what you make with it. OK, that green glow on the horizon to the southwest of you? That’s me, detonating in a critical mass mushroom cloud of jealousy. WHAT a great find! What a great price! And it is SO COOL that this dear old thing found a loving home. IRL I’m very happy for both of you and I can’t wait to see what you two are going to cook up together. I think you should call her “Doris,” after Doris Day, of course. She was in her heyday in the 60s. (Eyewitness report, this.) Congratulations! How wonderful! A couple of years ago I bought a sewing cabinet (sans sewing machine) for $7.50 The paint was peeling and it needed a good cleaning. I sanded it and re-stained it. It’s in my bedroom holding my perfumes and stretchy bracelets. Oh what a great find! I think you should name her “Kenny”! Soo neat! I love the cabinet. I can see why you bought it. I have a 1960 Pfaff that belonged to my grandmother and was the machine my mother learned to sew on. My Mom took it with her when she moved out at 18 and when I moved out my Mom gave it to me. I learned to sew on this machine too. Vintage machines ARE tanks! It’s hard to believe my machine is 50 years old, but I bring it in every year or two (depending on how much sewing I’m doing) to be serviced. I really hope you enjoy your new machine once you get it looked at. I’d love a follow up post to hear your thoughts on it once you use it. Great find! I have that same box of new accessories and use it frequently. I also believe the cabinets where the vintage machines live is the best way to house a sewing machine. They give you just the right amount of extra space to work but don’t take up much space. This is SUCH a great find! 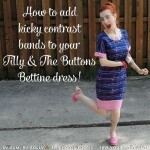 I love the “sew by color” box as well as all the different color-coded feet! For sure, old machines are fantastic tanks. Can’t wait until I have room for one! Whoa I didn’t know it had rainbow feet!!!! Or maybe you told me and I just didn’t get it until you unleashed the box of technicolor awesomeness and I actually saw them!! Sooooo coooollllll. Great find. Congrats. 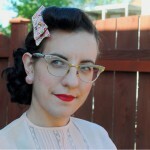 I know you will enjoy sewing with her. I don’t ever comment on blogs, and actually just stumbled upon yours (though I have the feeling I’ve been here before) but I thought how cool it was to think that somebody else has my exact machine, and wanted you to feel the same. I have this exact machine. It’s great. I paid a deal more for mine (already serviced and all that). I’ve been recently on the hunt for a buttonhole attachment for it. Though I’ve found some good information on said attachments, nobody wants to comment on WHICH machines they work on! I know this varies a good deal, but SOME idea as to the versatility of these attachments would be highly useful. Anyway, Mine is named Maude, as in Mauve Maude. 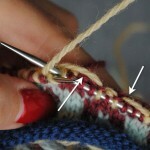 We’ve been happily together for some years now and I have made nice stitches with it. 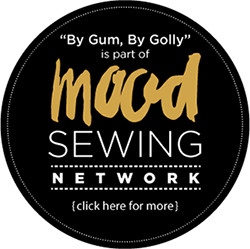 If ever you want to be chatty gals about our twin sewing machines, feel free. I’m sure Maude would love the attention. But my main sewing machine (I have 3!! a modern one and one from the 20/30’s) is also a Sears Kenmore Sewing machine from late 60’s early 70’s. Its that same lovely color as yours though it comes in a turquoise carry case. I hope you enjoy your new baby, I can’t sing the praises of 60’s -70’s Kenmore sewing machines enough! Just seeing this and absolutely loving that you bought this machine and are giving it a good home! I was searching the ‘net trying to find info on an older portable Kenmore I bought yesterday for $5 at a thrift store I love. Haven’t yet found the info I seek, but love your story. These older machines will last forever, we must adopt them and treasure them. Congrats on your *new* machine! 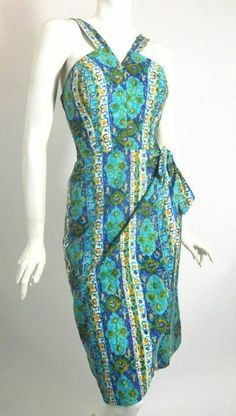 Tasha, I just happened across your blog while searching on vintage Kenmores. I have a 1960’s Singer 500 Slant-O-Matic (aka the Rocketeer) that came in a cabinet very similar to yours. Singer called that model the Fairhaven. My cabinet has a third drawer pull in the area above your two pulls. The cabinet face is designed to look as if there is a third drawer there. The interesting thing is – if you look inside your cabinet (either look up from where your knees go under, or lower your machine down and look through the hole on top), you can see there is a hidden area where the non-existent top drawer should be. I usually do not read blogs, but this one caught my eye. 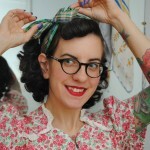 I too must admit that I am becoming a vintage sewing machine junkie. I love your find! You are so lucky to have the old girl waiting for just the right person to go home with…you! 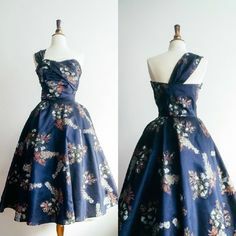 (I agree you should name it after the original owner) I enjoy sewing and I have found that less is more in a sewing machine. Here is the story. I have been teaching my daughter to quilt. She only has one sewing machine (I bought her a Brother) to use. We took a class together but needed to finish the project at home. I stayed with her one weekend to finish our project. She began to have issues with it. It went from bad to worse. 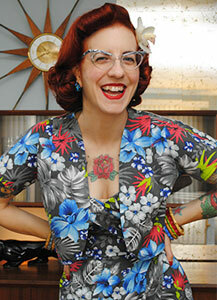 After that weekend I began to look for a dependable vintage sewing machine. I too have a vintage Kenmore and my Mom’s Singer from 1951. I checked out Ebay. There are tons of sewing machines to choose from. I happened on a Singer 403. I did a little research and emailed the seller to get some information from her. This was a real find! It came in it’s sewing cabinet. There was a drawer full of threads, bobbins, the manual and the attachments. Better yet it was local, so I could pick it up and save on shipping fees. All this for a mere $80. I ventured out with my GPS and my van ready to bring my find home. The sewing machine was wonderful. It was everything the seller said it was and more. I brought the machine home and my husband was amazed. He cleaned it and oiled it for me. And it just purrs when you use it. I have cleaned it up and can’t wait for Christmas. It is a gift for my daughter. You can get some wonderful bargins on Ebay. If you should go this route take your time and ask plenty of questions and don’t be afraid to ask for pictures of the inside of the machine. I have since added a Singer 500a the Rocketeer to my small collection. 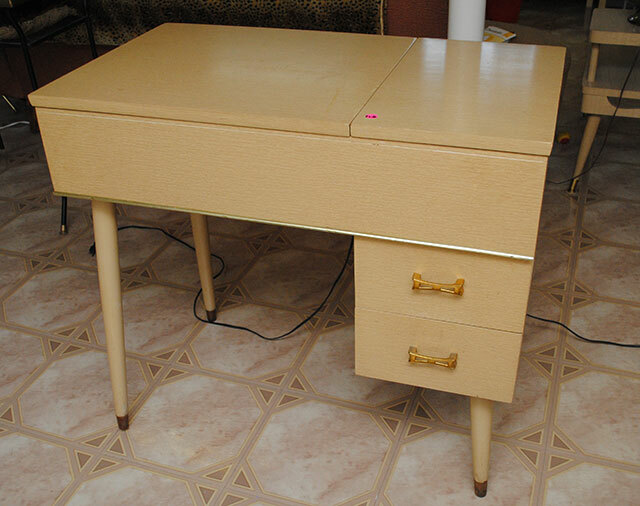 I found locally someone selling who was selling a foldable sewing table from the mid-century style from the late 1950’s to early 1960’s. I have never seen a folding table quite like this. It folds out and becomes the size of a large card table. It even has a drawer, and the machine folds into the table when not in use. I look forward to the day when I can go to an estate/garage sale and bring home such a find as yours. I have to agree with the others your lovely find was fate! Happy sewing! Love your machine. I have a couple like this. They are the best machines. Total workhorses. My local repair place makes house calls for the desk-mounted machines. Did you ever ask about that? Did you ever get yours tuned? If you must bring it in to the store, it’s very easy to take the machine out of the desk and put in in a standard size “portable” carrying case, if you have one. They just have a hinge mount that slides in and out. Wow! Excellent purchase! 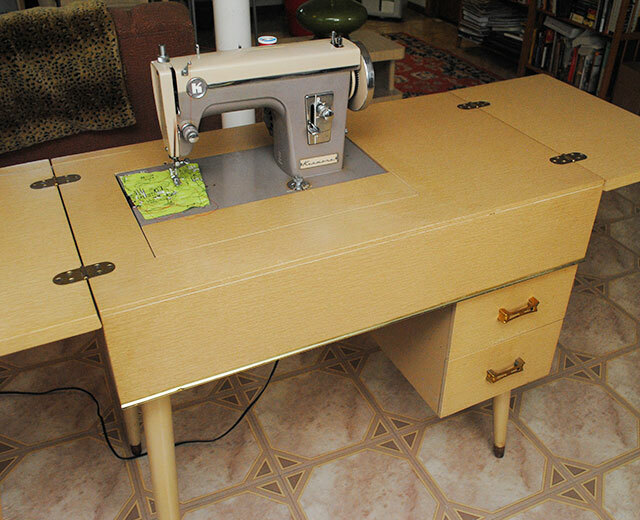 My mother just gave me the exact same sewing desk but she kept the Kenmore!!! I am in the process of adapting it to hold my machine (Brother SE350). I placed a piece of wood over the hole and actually got to use it yesterday. 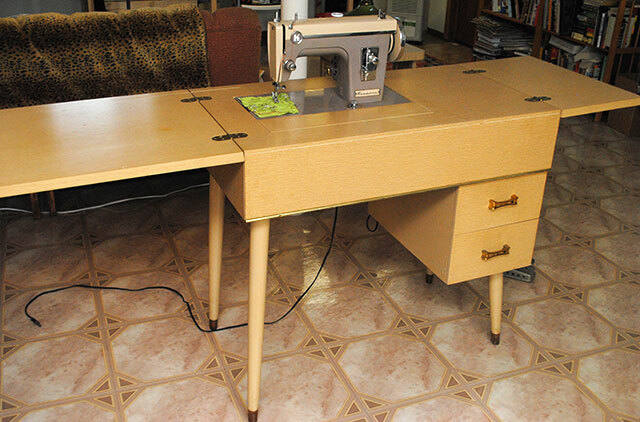 My grandmother also has a similar sewing desk that I learned to sew on years ago. You found a great treasure! I was in Kenosha Wi Christmas visiting my son. His neighbor across the street sat an old sewing machine on the curb. It was a Singer machine from the early 1960’s. 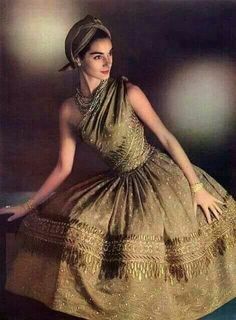 The only one I have seen to match pictures has been a Style mate. I had it cleaned as it had been sitting in mist and hadn’t been used for quite a while I am guessing. It cost 84.00 to get rejuvenated and checked over after tax, but that was worth it to me. I am going to use it as a loaner for little girls to have in their home while I am helping them to learn to sew simple projects. Then if they take a liking to sewing I will help with getting their own modern machine. I will also use it to sew heavy duty projects. Thanks for this web site and all the information I have enjoyed. I know I am in a select group of sewers who appreciate the quality and function of the old timer machines. My sister is still using her Kenmore she bought in 1972. I use an Elna but who knows which will become my favorite. 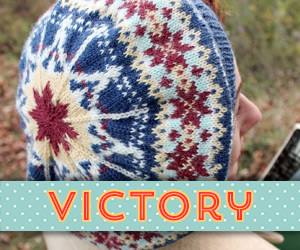 I have the same machine, I do the straight stitch but for everything else like zig zag and overlock I need a tutorial. Could you please make a video tutorial on how to use the machine. I have this exact table directly behind me, with the bracket for the full height legs broken. Is there any chance you can snap a photo of the underside of the table so I know what it’s supposed to look like? Thank you, and thank you Google Search for helping me find you. Tasha! You are so adorable and NOW, I do not feel like the only one not using their machines as quickly as one should. Have 4-5 black Singer featherweights and one snazzy beige one. Have CFIDS and life does go a bit slower for me. Love your Kenmore and color rocks. Is it? Keep us post when you get your machine in working order. Mine are working. Is it going to be costly to have machine running again? 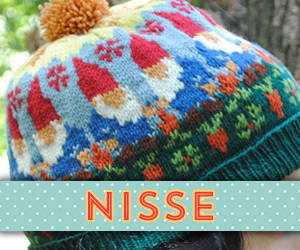 The other kit is the embroidery dies, and a button-holer kit. You mean accidently on purpose. Great looking machine and cabinet. Just found you and yourgreat find.. I grew up around Harlem and Irving area. Just inherited my moms sewing room items, she was an avid sewer from clothes to drapes to costumes. 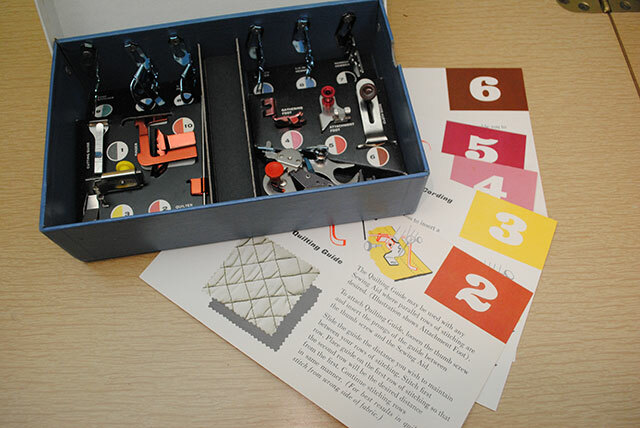 I have the exact Kenmore sew-by-color accessories kit but no instruction cards, having been looking for them, any idea how to locate a set, I need instruction too. Try ISMACS Database. 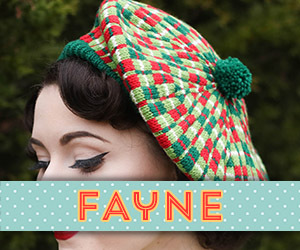 It is a site devoted to all sewing machines. I have been able to print up a manual for my Singer Redeye 66. You may have luck with Ebay or Do a search online for your Kenmore name and Model# and Manual. 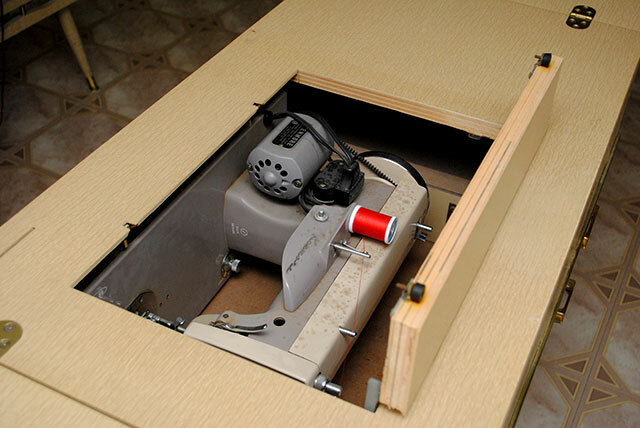 I have this sewing machine without the cabinet. It sits in the carrying case to use. 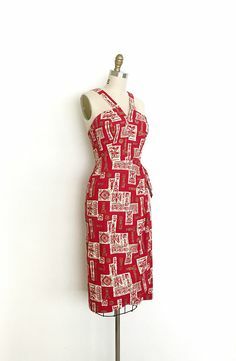 My husband bought it for me when I was trying to learn how to sew. He bought it as a surprise although I wanted a lighter one. I never did learn to sew. We are downsizing now and I was thinking of donating it to Hospice until I started researching it. I think I’m going to try and sell it before donating. My girls just lugged home the same machine. It was sitting out on the sidewalk across town with a Free Enjoy sign on it. They had to take turns carrying it. I’ve oiled it and guessed at threading and it works like a charm. I’m trying to find a book for it. I’m guessing that it is not a zigzag machine because I don’t see any way for the needle to move from side to side. I also don’t know what the dial in front is for that says DOWN 1 2 3 UP. the sears parts web site has almost all information and downloadable manuals for the machines. 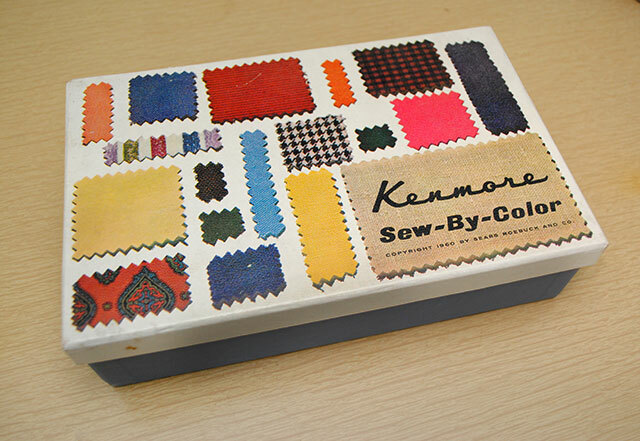 I have a 1960 Kenmore Sew-By-Color accessory kit. It is missing the manual/booklet and the cards and a couple parts. I am not exactly interested in purchasing another on ebay or etsy…i just want directions on how to use it (and to know if it will work on a machine made 20 years later). I cannot find any information for that, even on the sears parts direct website, which i have found to be a useful tool over the years. i enjoy reading your blog. congrats on your find! my 90-ish aunt has a kenmore stylist 86 (model 148.861, no cablnet) but has lost her owner’s manual. i can’t find a manual on ‘sears parts direct’ so was wondering if you had any suggestions of where to look? although original paper booklet is best, *.pdf is OK too. thx in advance for your help. HI! I just bought the exact same model from a thrift store for $20. I took it to a sewing machine repair center and the motor is completely locked. But anyways, he told me that it only has one cam. Can you post a picture of the cams that came with your sewing machine? I don’t know what color I should be looking for on ebay.